Bootie comes to Canada for an epic ONE OFF! 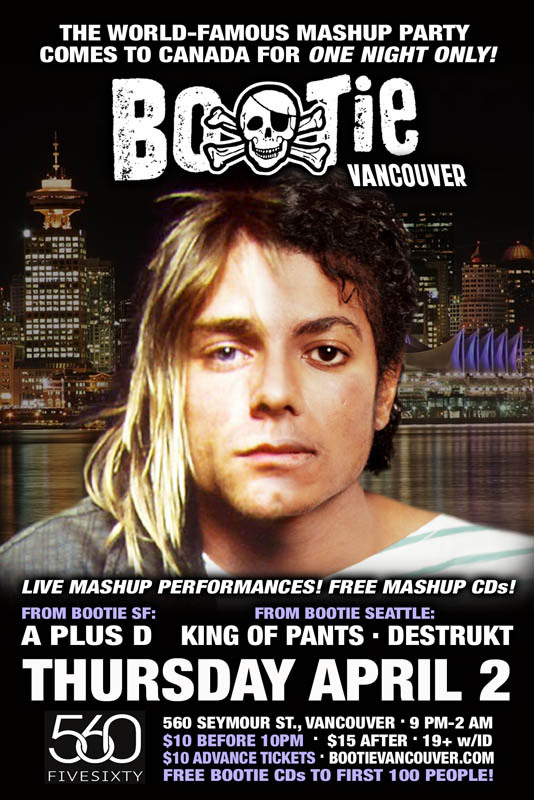 Bootie Mashup, the international club brand that has helped popularize mashup culture around the globe, comes to Canada for ONE NIGHT ONLY! Headlining this night of mashup mayhem will be the club’s creators, San Francisco DJ duo A Plus D, who for more than a decade have become internationally-known as not only tireless torchbearers of the mashup genre, but mashup producers and performers in their own right. In addition to DJing, they also add a live element to their sets, as DJ Adrian (who also fronts live mashup band Smash-Up Derby) takes the mic to sing a few mashups live! As the SF Weekly wrote, “Committedly unpretentious and ready to rock, A Plus D deliver the perfect remedy for the occasionally snooty, often staid dance scene.” Helping them keep the night going will be Bootie Seattle’s resident DJs, Freddy, King of Pants, and Destrukt, as they all spin the best mashups in the universe!